The Jind police have arrested a youth in connection with the misuse of biometrics of an Aadhaar operator of the State Bank of India (SBI) in Uchana town. The accused, identified as Shamsher Singh, works as a bank “mitra” with the SBI. He is a friend of complainant Vikram Sheokand, whose Aadhaar credentials have been misused. Jind SSP Ashwin Shenvi said the accused had been taken on two days’ police remand. “The police and a team of the Unique Identification Authority of India (UIDAI) are working in tandem to investigate the case,” he added. Sources said the complainant was called for questioning today. On January 29, Vikram had lodged a complaint with the police about the breach of his Aadhaar biometrics by unidentified persons. He said Rs1,000 and Rs7,500 were transferred from his biometrics-protected bank account on November 14 and 20 last year. He had lodged acomplaint with the UIDAI on November 22. Sheokand had also alleged someone else logged into his biometrics-protected Aadhaar account in November and committed 646 errors which drew a penalty of Rs33.4 lakh. 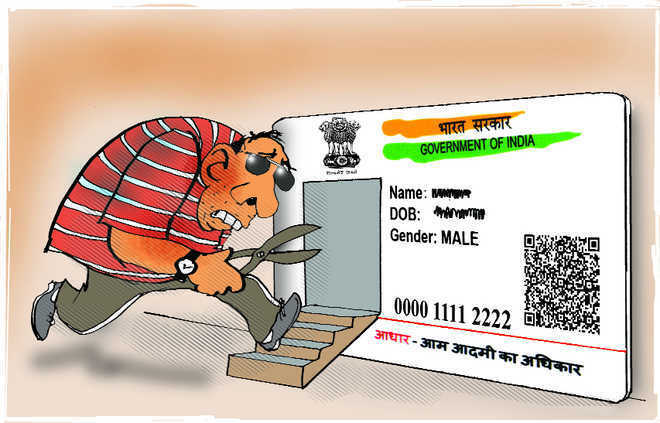 An error report from the UIDAI had mentioned Sheokand had used multiple station IDs to log into his account for several Aadhaar enrolments without valid documents.